The interest in potentially economically valuable plants (for food, timber, dyes, fabric, and drugs) was part of the concerted effort given by colonial governments towards providing botanic gardens in new colonies. While convicts and guards laboured in Brisbane Town from 1825 until 1849, botanists such as Alan Cunningham were discovering the delights of native plants in their numerous excursions. Their observations and collections of seeds were sent south (to the local botanic gardens at Melbourne and Sydney) and onward to the Royal Botanic Gardens in Britain (at Kew and Edinburgh). This set the local pattern for future exchanges among the global British Imperial botanic garden network. 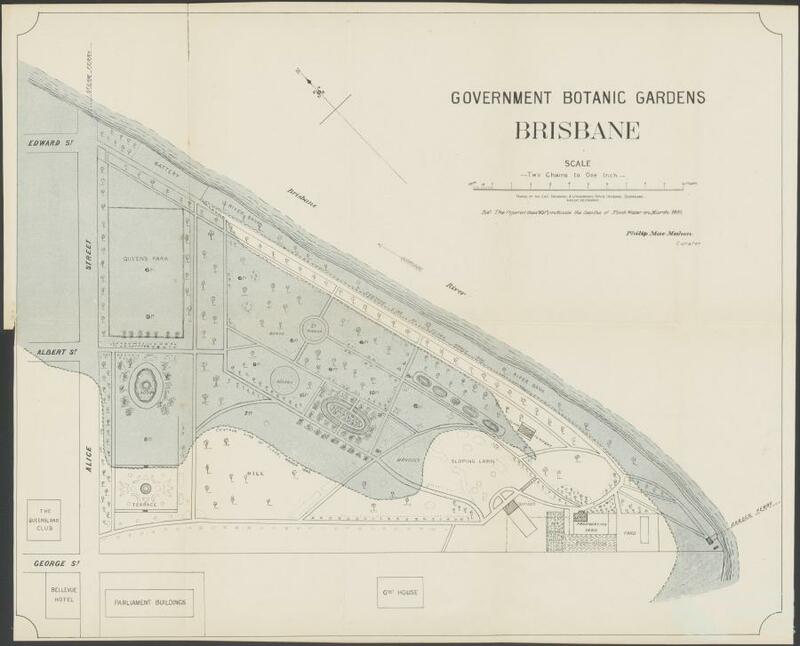 The first botanic garden in Queensland was established at Gardens Point, Brisbane in the area of the original Government Garden. 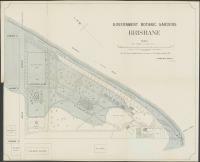 In 1855, the Brisbane Botanic Garden was proclaimed officially and a Scottish curator Walter Hill was appointed. Other regional botanic gardens were established in the 1870s-90s to further the process of testing native and exotic plants in different climates. Cooktown, Townsville, Rockhampton, Mackay, Maryborough, Toowoomba and Warwick still retain vestiges of these early government botanic gardens, most now thriving as public parks, as is the Brisbane City Botanic Garden. Botanic Gardens and their intrepid professional gardeners and directors were important agents in influencing the State’s development. Many of the current agricultural industries originated in the trial beds and bush-houses of botanic gardens, from sugar and wheat to tea and grape vines. Allied to the experimental work of these public gardens was the private garden at Bowen Park, owned by the Queensland Acclimatisation Society, operating from 1863 until the early twentieth century. The 1850s and 1860s were times of great change for north-eastern Australia. In 1859 Queensland was proclaimed a colony separate from New South Wales and faced a severe economic Depression in the following decade. Arguably, the struggle to establish a stable government and a vigorous economy lasted until the twentieth century. This was due in part to unfamiliar and unreliable climatic factors (floods and droughts), individual self-interest, short-sightedness and government mismanagement. The hopes of the European settler or 'newcomer' included visions that ranged from creating an aristocratic pastoral Arcadia to being free yeomen owning their very own farms. The wide-spread perception was that the natural bushland in Queensland was threatening, and required hard work to overcome. A common attitude among newcomers was that pioneers had to 'conquer' the land for the Australian colonies. The variety and unfamiliar character of vegetation in Queensland may have contributed to this unease. There were occasional lush rainforests which varied in character and form across the State: from sub-tropical dry-vine types along coastal rivers, to vestiges of temperate closed-forests on the high Lamington Plateau, to the true wet tropical rainforests in the far north. The other types of natural vegetation (wetlands, heaths, and the large areas of grasslands, woods and forests) were similarly varied, and often as difficult to remove or 'manage' for newcomers. None of them resembled the countryside of Britain. 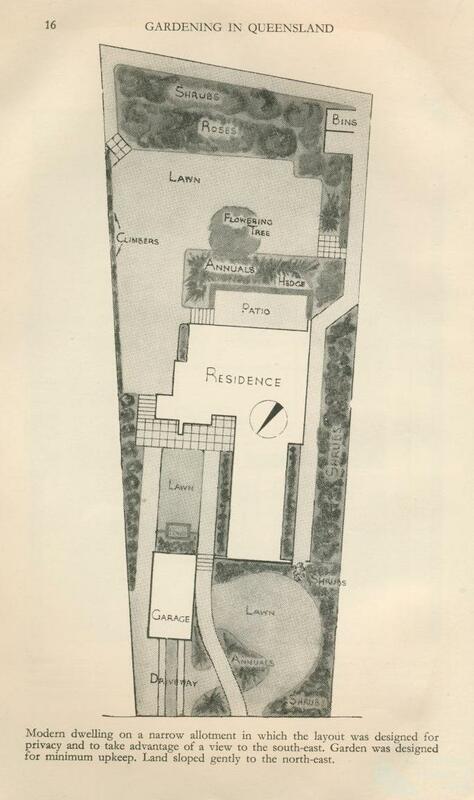 Initial European settlements in Queensland entailed 'survival gardening' which was always reliant on water. Finding reliable supplies of water was the first step in the selection of properties – water for humans, stock and the all-important garden. 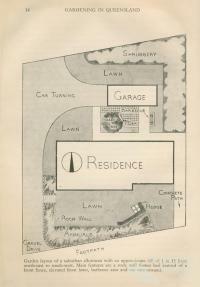 The next step in house and garden selection was avoiding damage by floodwater or storm water. After severe floods or the closure of mines, timber houses were often moved to more suitable locations, which implies that gardens were lost and remade in the process. The portability of timber houses in Queensland has been described as an important factor in settlement in some areas. Survival gardening was about producing food and materials that were useful, indeed, vital for the families of settlers to survive. Fruits, vegetables, cereals and herbs provide the fundamentals for this sort of gardening. In warmer climes, this entailed experimenting with strange tropical plants as much as testing the viability of familiar temperate favourites. 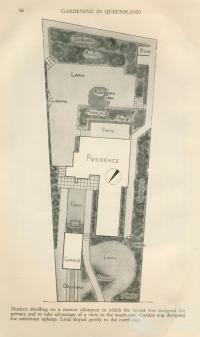 Even the earliest gardens featured a small component of ornamental planting, flowers being the typical favourite, and roses the preferred flower. Ornamental features had many associations for the new-comers: they reminded the settler of home (in Europe), they acted as an offering of hope for the future (in their new Antipodean home), and because flowers give cheer without even trying. This was especially important after the long, hard days of work and the irregularities of Queensland climates that dominated the lives of the pioneers. Plants that provided a dual function – of both ornament and food – were naturally very popular. Grape vines could provide shade to the verandahs and bear fruit. In the winter months, they even dropped their leaves to let the warming sunshine onto the verandah. Many homestead and town gardens alike, share this common heritage where the kitchen garden, orchard and often a vineyard were crucial, but where the flower garden, no matter how small, was treasured as well. The new European settlements in Queensland were characterised by the clearing of bushland to make way for building, industry and agriculture. In the nineteenth century, the dry-vine type rainforests were called 'scrub', and the seemingly impenetrable temperate rainforest of the Lamington Plateau became known as the 'Big Scrub'. These devaluing names helped to 'conquer' the implacable and foreign landscape. Even among the forest conservationists of the late nineteenth and early twentieth century in Queensland, these ancient forests continued to be called 'scrubs' or 'scrubland'. Development of the natural landscape meant clearing as much bush as possible, no matter how steep the hills or massive the trees. Precious pockets of good soil were prized locations for early market gardens, for small multi-purpose farms or for the occasional large mansion estate. Places like the deep black soils around Gatton on the Laidley Plains or the red soils of Redland Bay, Toowoomba, Tamborine Mountain and around the Glasshouse Mountains north of Brisbane were especially prized. More recent historians have recorded the degradation created by short-sighted development in unfamiliar environments in the nineteenth and twentieth centuries in Queensland, while many earlier writers saw only positive outcomes. Kevin Frawley called this type of development Australia-wide as ‘exploitative pioneering’. Fitzgerald's assessment was that early Queenslanders held a ‘ruthless attitude to natural resources and the environment’ and he maintained that this attitude remained alive into the twentieth century and thrived among the conservative politicians of the early 1980s. However, there were early dissenters and expert critics of these exploitative practices in the late nineteenth century, especially as decades of poor rural management and extensive deforestation produced physical evidence of land damage, such as erosion, poor agricultural returns and species (flora and fauna) extinction. Local scientists (including botanists, natural historians and medical practitioners) wrote papers and letters publicly warning of these unsustainable practices, but generally their advice fell on the deaf ears of politicians until the new century dawned. The creation of the Department of Forestry in 1900 and the setting aside of the early National Parks from 1906 to 1915, marked this change in attitude. Agricultural practices were slower to mend their exploitative ways, as extensive chemical use was encouraged by scientists after World War I, until the 1960s at least. 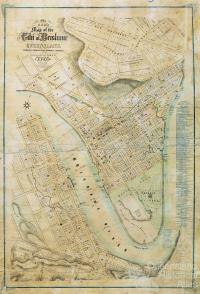 The development of Queensland urban settlements followed several recurring patterns over the years. These patterns often involved pastoralists pioneering new areas, to be followed by farmers, or else the discovery of gold began the advent of permanent or short-term settlements. After Gympie's rich gold supplies were found in 1867 (and allegedly saved the fledgling colony from bankruptcy), other gold sources were sought out in earnest. Boom towns grew up overnight and lasted until the alluvial ore ran out. Some towns, including Charters Towers survived and went mining underground, and later acquired new functions. Ports were created up the coast to supply the mines and take away the ore and eventually the agricultural products: places like Cooktown for the Palmer River, Cairns for the Atherton Tablelands, Townsville for Charters Towers, Rockhampton for Mount Morgan and so on. It was not until the 1920s that the railway extended up the coast, thus linking Brisbane with Cairns. Prior to that, railways were constructed east-west, from the leading ports (Brisbane, Rockhampton and Townsville) to each productive hinterland. For many years this decentralised settlement played upon the character of the Colony, as several major divisions were perceived: between city and country; between coastal and inland; and between Brisbane (in the extreme south-east corner) and ‘the north’. In many respects, these divisions still exist. In Mackay and even Townsville, there are still dreams of a separate State of North Queensland. The idea of a northern colony was raised again in 1883, in response to the Liberal Premier Samuel Griffith’s decision to ban the importing of coloured labour (stolen South Pacific Islander people called 'Kanakas' by the Europeans). The comparison to the United States was made: with North Queensland likened to the American South, with their grand plantations and African slaves. The perception of isolation from the Colonial or State capital has been a recurring theme ever since in local politics, and by extension, commerce and industry. Within the urban areas, the elevated sites were taken up first by wealthy selectors and remain today as the locations most likely to yield a significant historic residence and garden. These prominent positions were often supplemented by the feature planting of Araucaria spp. and Queen palms (Syagrus romanzoffiana), which make distinctive silhouettes atop the ridgelines in nearly all weathers. This practice may have derived from the observations of the emergent hoop pines in local natural forests by early settlers and visitors. To support the settler (in town or country) in making gardens, local commercial nurseries and seed merchants were set up mostly from the 1860s onwards. Among the earliest local nurseries were those owned by Albert Hockings at South Brisbane (c1858), Samuel Eaves at Breakfast Creek, Brisbane (1864), and Carl Hartmann in Toowoomba (1866). A semi-public garden, experimental ground and nursery was established by the Queensland Acclimatisation Society in 1863 at Bowen Park in Brisbane. This establishment rivalled the Brisbane Botanic Garden in the provision of seeds and plants for settlers (provided they were subscribers). Large nursery operators from southern Australia also offered produce and advice (albeit usually climatically unreliable). This wealth of supply continued until World War I, when a downturn in ornamental gardening had effects Australia-wide. By the 1880s in Queensland, there was a growing body of horticultural experience and botanical knowledge which culminated in the establishment of the Department of Agriculture in 1887. This government body took over the management of the government botanic gardens and subsequently set up the first tertiary education institution in the State: the Gatton Agricultural College opened in 1897. The new discoveries and attitudes expressed by North American agriculturalists and horticulturalists were greatly admired at this time. As part of this scientific vision, the problems of unrestricted plant and animal importation were recognised. By 1896, the Diseases in Plants Act determined the end to widespread imports of plants and seeds. This legislation was enacted to protect local farmers and their harvests from the effects of pests and diseases created by the lack of quarantine. The age of the amateur botanist or enthusiastic commercial nursery proprietors who could freely import and export plant specimens was drawing to a close. While increasingly 'science' was the catch-cry of farmers and professional gardeners in the late nineteenth century, the natural environment was being spotlighted for study as well. The exploration and recording of the flora and fauna in Queensland is actually older than its settlement. Joseph Banks and associates began collecting on the 1770 voyage of discovery with Captain James Cook. These collections and descriptions of the Australian landscape have been recognised as ‘almost wholly descriptions of Queensland’. By the end of the nineteenth century there was also a growing aesthetic and sentimental appreciation for these natural landscapes. The ancient forests such as on the Lamington Plateau, scenic areas, vistas, waterfalls and lakes were targeted as tourist destinations, along with seaside resorts. Travel and recreation grew in popularity as part of the social and physical landscape from the late nineteenth century. The extent of influence from these natural environments on the design of contemporaneous gardens has yet to be established. However, rainforest favourites such as staghorn ferns, elkhorn ferns and orchids were in common gardening usage by the 1890s, and native trees (many being from rainforests) were recommended for planting in schoolyards. The popularity of native wildflowers was particularly noticeable during the early decades of the twentieth century. 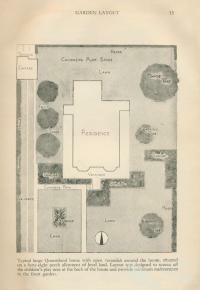 Several important events affected horticulture and landscape design in the early twentieth century. The federation of the States and Territories into the Commonwealth of Australia in 1901 was a major historical event, but did not bring about an end to inter-State rivalry. The consolidation of Australia was arguably the result of World War I (1914-18), which devastated every community across the State and the nation. Grief and pride united the country. The universal expression of these feelings was the construction of war memorials (usually within designed landscape settings), which proliferated in the 1920s and 1930s. These statues of 'diggers' (soldiers) or monumental stone cairns were the first wide-spread public sculpture in Queensland. War memorials and remembrance ceremonies on Armistice (or Remembrance) Day (11 November) and Anzac Day (25 April), which bonded communities (across classes, religions and politics) for many decades thereafter, have occurred ever since. Few memorial avenues of trees or memorial gardens were established in Queensland, as sculptures and monuments were the most popular forms of memorials. The national war memorial for Queensland in Anzac Square, Brisbane opened in 1930 and contained three regular, radiating pathways (symbolising the three services of army, navy and airforce) lined with Butia palms and Queensland bottle trees. This formality of planting (hedges, lines of conifers on the side boundaries and avenues) was an unusual addition to the Queensland designed landscape. By the turn of the twentieth century, Queenslanders had gained some two or more generations of gardening experience of local conditions and climates. They were becoming familiar with the opportunities and constraints of gardening in the sub/tropics. However, the effects of weeds such as the Prickly Pear, World Wars and economic Depressions stifled gardening practices in the State. Ornamental gardening was the first to suffer while vegetable and fruit gardens justified by their usefulness even in the hardest times remained as the most popular form of private garden in the early decades of the twentieth century. Agricultural and horticultural shows, established in the late nineteenth century in almost every town or district in Queensland, continued the striving for excellence in plant-culture. 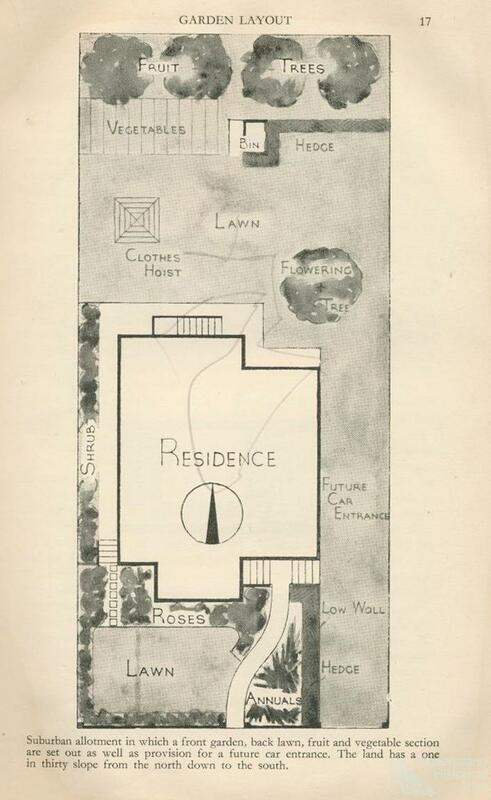 However, concerns about designing gardens and landscapes was less popular. 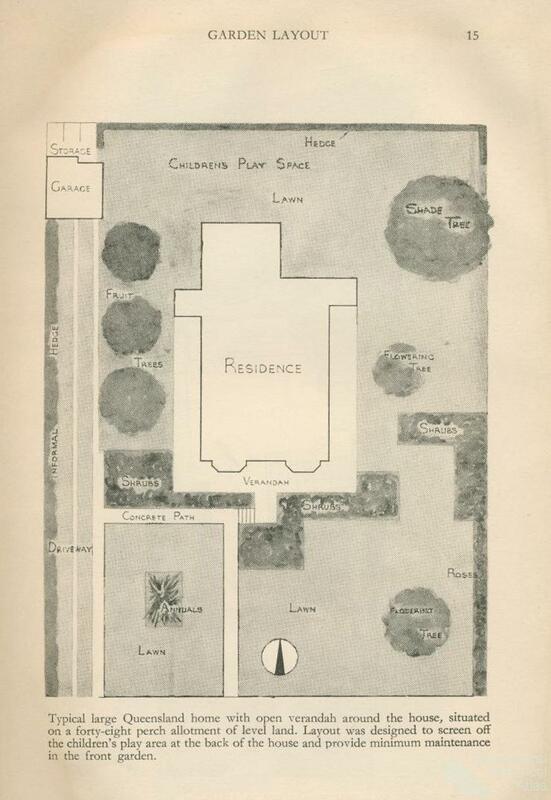 Garden competitions (especially between railway stations, schools or private residences) continued the emphasis on growing ephemeral annual plants, with only scant attention given to their overall arrangement and long-term garden character. Competition judges noted these circumstances, but little changed in the way the competitions were held. Public parks were a feature of many larger urban centres from the late nineteenth century. Using the guidelines for Government Surveyors, Queensland urban centres were surveyed with reserves set aside for recreation, parks and gardens, and sometimes for scenic lookout or botanic garden purposes. As the municipalities grew, some of these reserves were developed as botanic gardens or as public parks. Botanic gardens such as these continued to play a role in the community as public recreational parks. 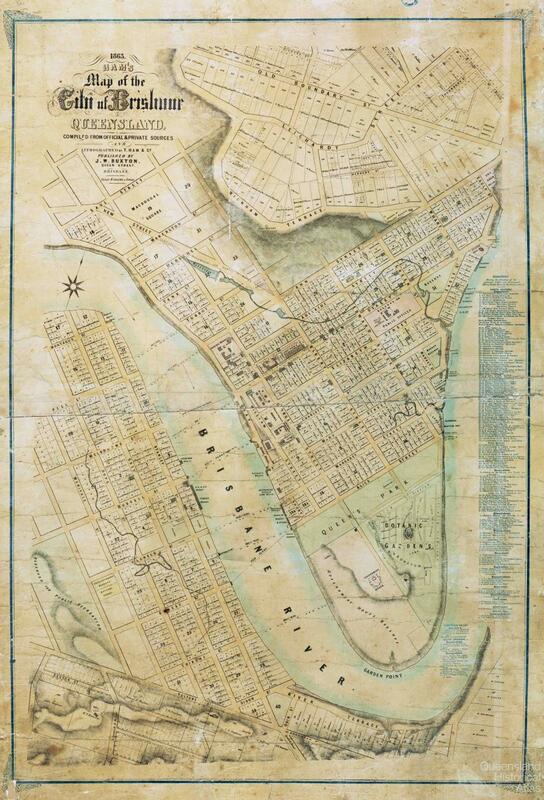 Early efforts at town-planning and urban design in Brisbane were highlighted with the second national Town Planning Conference held there in 1918. These efforts included the development of several new public parks: New Farm Park, Newstead Park and a renovated Bowen Park, by then owned by the Brisbane City Council. Coinciding with these events was the influence of the Playground Association, which established specialised children’s playgrounds at Paddington (1918), East Street, Fortitude Valley (1922), and at Spring Hill (1927). The first of these playgrounds was featured at the Town Planning Conference of 1918. These supervised playgrounds legitimised the outdoor play of children, connecting these activities with good health, sunshine, clean air and education, particularly for those in working class suburbs. Subsequently, the creation of playgrounds in public parks (unsupervised) and school grounds proliferated. The availability of motor transport after World War I led to an expansion of recreational opportunities. The seaside, the mountains and the countryside were all destinations for caravanning travellers and day-trippers alike. Tourism in Queensland became a serious economic industry between the world wars, made possible by the rich variety of natural resources of beaches (surf, sand, tropical islands and coral reefs), 'jungles' (rainforests on the Atherton Tablelands, Tamborine Mountain and the Lamington Plateau) and numerous scenic waterfalls in many parts of the State. The design of the garden settings for private resorts and public parks has gone relatively unnoticed and unrecorded, and yet the remnants of sites and their landscape characters remain. These places were mainly the work of professional gardeners who maintained the landscapes in question. 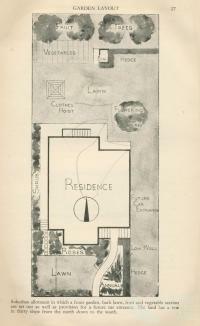 The character of mid-twentieth century gardens in Queensland was decidedly exotic and tropical. Native plants were incorporated, but the overall idea was to create an eclectic mixture of the bold and bizarre, the bright and colourful, using mostly tropical plants. This is true of the coastal regions. In the colder areas such as Stanthorpe, Warwick, Toowoomba and Tambourine, gardeners continued to make traditional 'English' gardens, either formal or in a cottage style. It was not until after World War II that monographs featuring garden design ideas (albeit scant) and tropical planting advice appeared again. 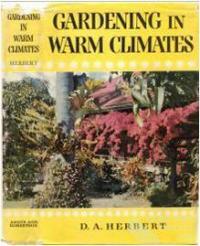 Two major local publications frame the post-World War II era: Gardening in warm climates and Gardening in Queensland. Most professional landscape designers arrived in Queensland after World War II, although architect/planner/landscape architect Karl Langer arrived in Brisbane in 1939. He was instrumental in the selection of Bennelong Point as the site of the Sydney Opera House, and setting up the professional institutes of both the Planners and Landscape architects in Queensland. His urban design ideas were revolutionary, and included the first proposal to make a pedestrian mall in Brisbane (Adelaide Street) and the creation of residential canal estates based on the Radburn planning principles on the Gold Coast. The next arrival was in 1948 when Harry Oakman joined the Brisbane City Council’s Parks Department and became the first landscape architect to be employed by a Queensland government authority. The profession of landscape architecture was established by the late 1960s, with tertiary training in the field provided at the Queensland Institute of Technology from 1968. The rise in popularity of native plants was marked during the 1970s with ideas of bush gardens, low-maintenance gardening and water-wise approaches. By the 1990s landscape architecture began to develop more sophisticated approaches to planting and unified design concepts. In the twenty-first century cultivation and garden design is at its most diverse.